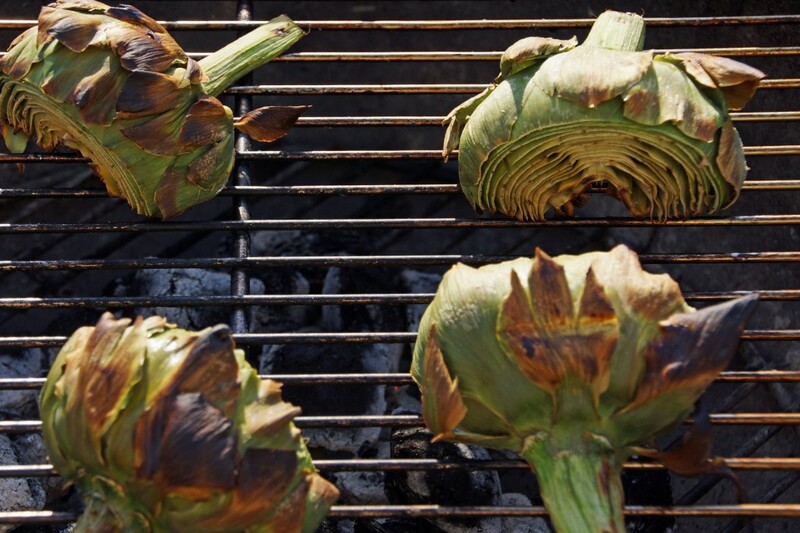 It had never occurred to me to grill an artichoke until last spring. Boy, was I missing out! Just trim them up, cut them in half, and toss them on the grill. The artichokes are ready when they’re dark and char-y on the outside and tender on the inside. While you wait for the artichokes, whip up a homemade mayonnaise, spiked with lots of crushed garlic. The thought of making homemade mayonnaise used to scare me, but once you make it and see there’s really nothing to it, your fear will forever be conquered. 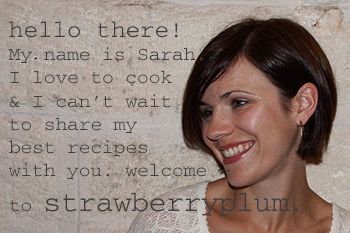 Stretch your arm out and get ready to whisk. Beat an egg yolk, until it’s pale and creamy. I whisk in a little Dijon mustard at this point. Slowly, add olive oil, drip by drip. It helps to have a partner. Did our neighbors totally see me and Matt standing in the backyard, making mayonnaise as a team? Yes, they did. Did they judge? Most likely. Did they see me taking pictures of the whole experience and decide we’re even crazier than we were last summer? For sure. Whatever. This is how we live. Whisk in a little lemon juice and a couple of smashed garlic cloves to turn it from mayonnaise into aioli. Season it up with salt and pepper and you’re done. …or you could make the most of your lit grill and really go to town. 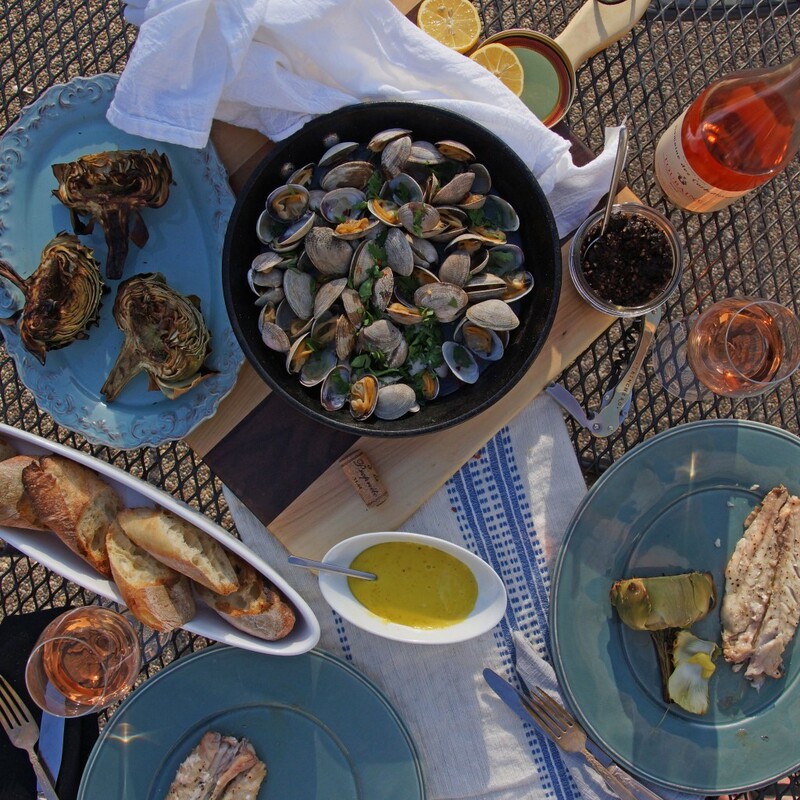 We added a couple of fish, a pan-full of clams, and sliced baguette to our feast. The fish were brushed with olive oil, salt, and pepper, then grilled and served with lemon and a spoonful olive tapenade. 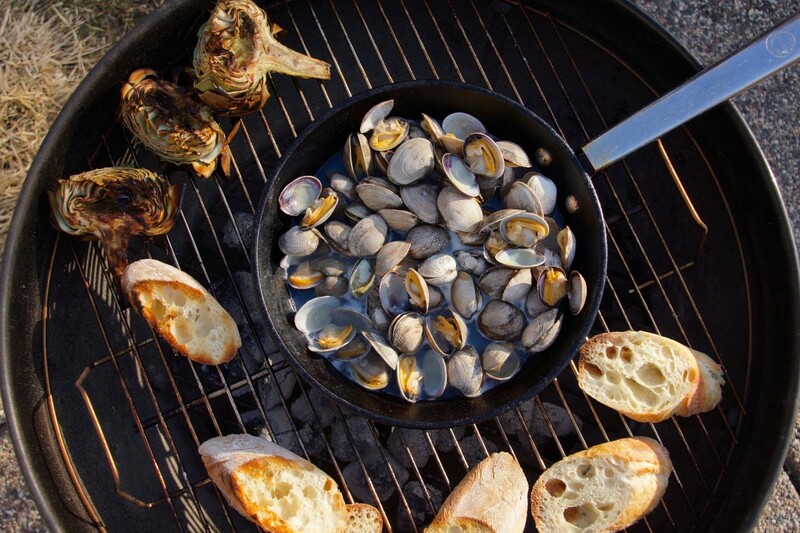 The clams got doused with white wine, set on the grill ’til they opened, dabbed with butter, sprinkled with parsley, and splashed with lemon. Light up the grill, set the picnic table, grab a stack of napkins, and pop a bottle of wine. Spring is here; let’s make the most of it. Garlic aioli makes anything delicious, but it is especially good with grilled artichokes on a glorious spring day. Light your grill. I use a Weber. 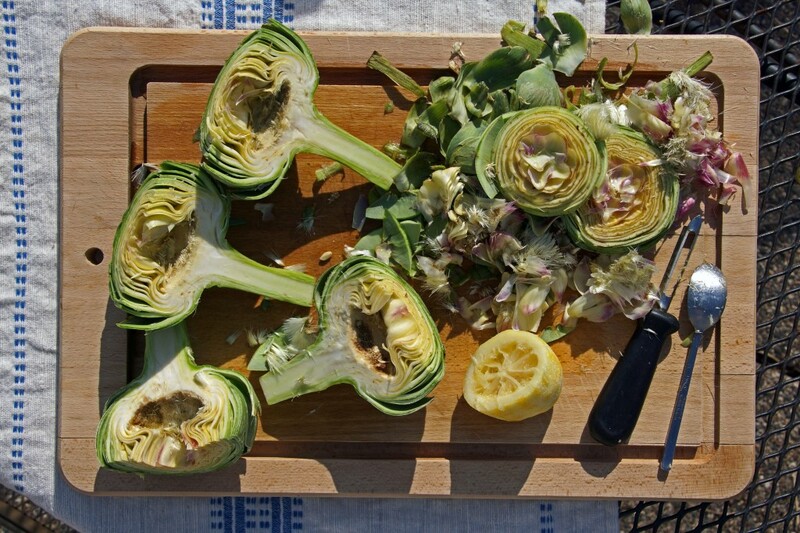 Trim the artichokes. Cut the top third off the top, peel the outer layer off the stem, and cut in half. Use a small spoon to remove the fuzzy choke and the prickly inner leaves. Rub with a little olive oil and place on grill. Grill until the heart is tender, about 45 minutes. If you want to speed up the grilling time, you can steam the chokes until almost tender and transfer to grill to finish. 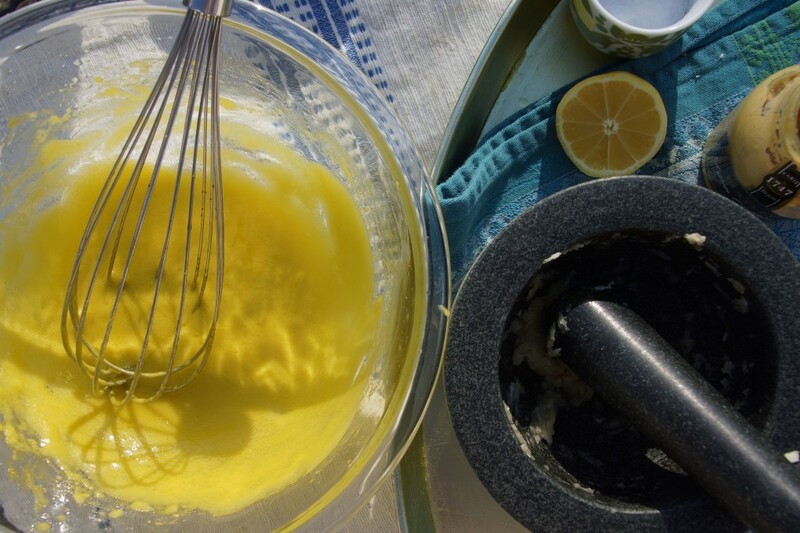 To make the aioli, place the egg yolk in a medium bowl and whisk until pale yellow and creamy. Add the mustard and whisk to incorporate. Slowly add the olive oil, while whisking. Add it drop, by drop at first, then in a slow thin stream. It helps to have someone else pouring the oil as you whisk. You can do this in a food processor, but I feel less guilt about eating way too much aioli if I make by hand. The mixture will emulsify as you whisk, keep adding oil until you reach your desired consistency. If your emulsion breaks, don't give up! It happens. See the notes to get back on track. Smash the garlic cloves with a pinch of salt, using mortar and pestle until it becomes a smooth paste. Alternatively, chop as finely as you can. Whisk the garlic into the mayonnaise. Ka-pow--the mayonnaise has now been transformed to aioli! Add lemon juice, salt, and pepper to taste. 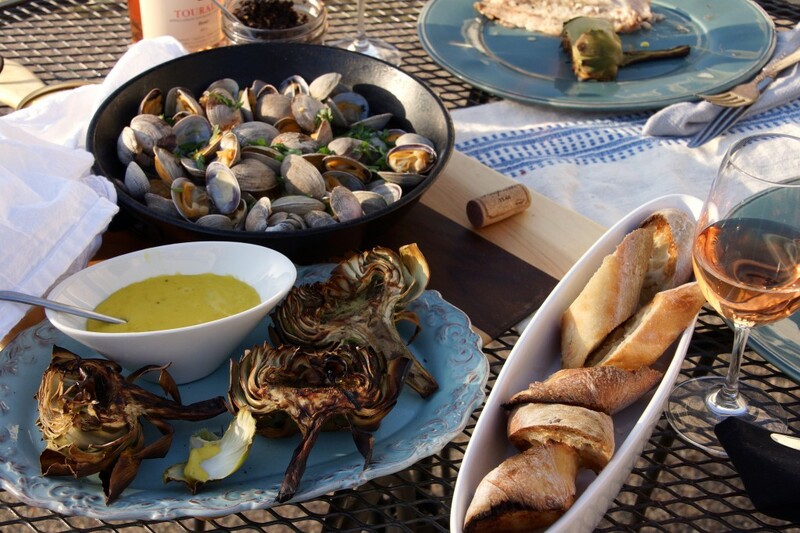 Serve the artichokes warm or at room (patio) temperature. Pull the leaves, one by one, and dip in the aioli, until you reach the heart. Slather the heart with aioli and ask yourself if there's anything better on this earth. If your mayonnaise breaks, grab another bowl and another egg yolk. Whisk the egg yolk until pale and creamy and then slowly add the broken aioli, repeating the whole procedure. You'll end up salvaging the broken mayo and your end product will be just that much richer and more delicious with the addition of the extra yolk.